Do you want to be near the energy and opportunities of New York City - but prefer to attend college on a quiet, suburban campus? FDU's Metropolitan Campus may be the place for you. With its strong career focus, this campus is home to many of FDU's business, professional, science and health care programs. It's a celebration of diversity, too, attracting students from 63 countries. 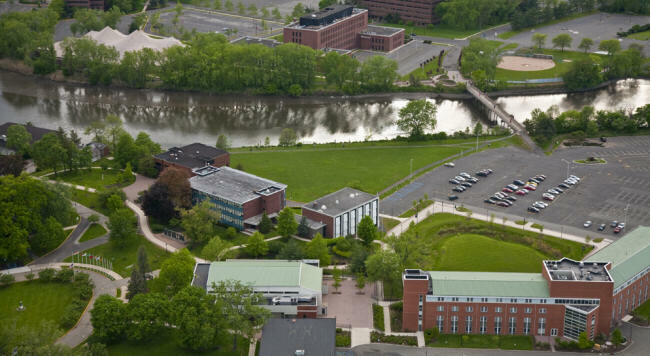 Running through the heart of campus is the Hackensack River. Quaint homes, shops, ethnic restaurants and parks are near by, as well as shopping malls, community groups, and office and professional buildings, where many of our resident and commuter students alike find part-time jobs. You'll also like the campus' proximity to New York City, where you can study Broadway, Wall Street and the United Nations up close and in person! There are 4,114 undergraduates and 2,350 graduate students attending the Metropolitan Campus. Minority and international students comprise 21% of the student population. Northpointe, a 300-bed residence hall, opened in 2003, facing the new Fitness Center. Sports include Men's Division I programs in baseball, basketball, cross country, golf, indoor and outdoor track, soccer and tennis; Women's Division I programs in basketball, cross country, fencing, indoor and outdoor track, tennis and volleyball; and Intramural Sports in basketball, billiards, bowling, flag football, horseshoes, softball, table tennis, tennis and volleyball. The center of sports activity is the Rothman Center, with facilities for basketball, tennis, racquetball and volleyball, plus a six-lane, 200-meter track, weight room and spectator seating for 5,000. Three of every four undergraduates on the Metropolitan Campus commute to class from home or nearby apartments. There is ample parking and the campus is near several major bus and train stops. Others live in campus housing, including the recently renovated University Court. Interested resident students can take advantage of special interest living options such as 24-hour quiet, honors, and health and wellness housing. Undergraduate studies on the Metropolitan Campus are offered through these three colleges: University College: Arts · Sciences · Professional Studies, the Silberman College of Business and Petrocelli College of Continuing Studies.